The reptiles also would not bite the people at the Kondalarayudu temple. 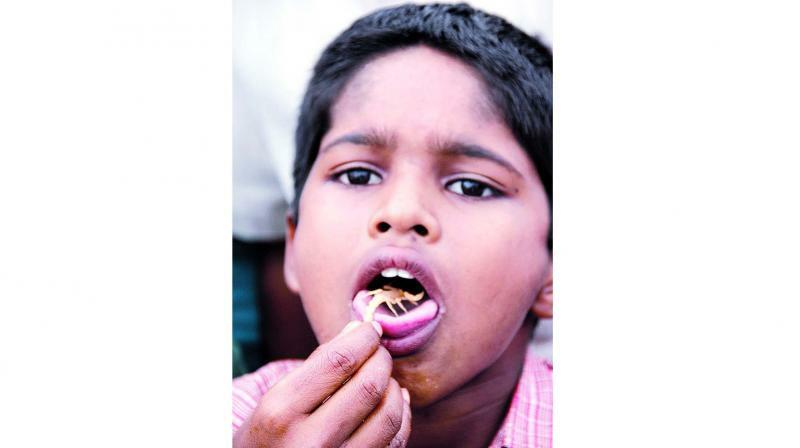 A boy puts a scorpion in his mouth. Anantapur: Tirumala Kondala Rayudu temple was crowded with devotees offering scorpions to the deity at Kodumur in Kurnool district on Monday. The tradition of offering live scorpions to the deity on every third Saturday of holy Shravana masam is a decade-old tradition for the devotees of Kodumur. The villagers competed with each other to catch the scorpions in the hilly area. they then kept them the scorpions on the deity without harming themselves. The reptiles also would not bite the people at the Kondalarayudu temple. The temple is located on Kondrai Konda hill area on the outskirts of Kodumur mandal head quarters. Devotees thronged the temple to offer pujas. They came to witness the astonishing sight of the live scorpions being placed on the deity. People of Kodumur and surrounding areas believe that the reptiles would not harm them while they work in their fields and at their homes if they offer poojas to the deity by catching live scorpions. Mallikarjuna Gowd, a devotee who kept three scorpions on his head, said the reptiles would not harm the devotees.